It is important to know that a blizzard is a storm that meets specific weather guidelines. Officially, the National Weather Service defines a blizzard as a storm which contains large amounts of snow or blowing snow, with winds in excess of 35 mph and visibilities of less than 1/4 mile for over a 3 hour period of time. Therefore, a blizzard can be any type of storm that meets the definition above. However, a Nor'easter is a specific type of storm that moves up the east coast and is famous for producing rain, snow, sleet and of course, strong northeasterly winds. A Nor'easter becomes a blizzard when it meets the National Weather Service definition of one. Therefore, not every Nor'easter is a blizzard and not every blizzard is a Nor'easter. A Nor'easter is a specific type of storm. Nor'easters develop from weak disturbances moving out of the Plains that encounter large areas of moisture. The two most common areas that these powerful storms develop are in the Gulf of Mexico or just off the coast of North Carolina, as shown in Figure 1. These storms collect moisture from the Gulf and Atlantic as they rapidly develop in the southeast. Heavy rain and thunderstorms often result. The storm then begins to move northeast up the coast and usually encounters colder air. Often as the storm moves into the Northeast part of the country, enough cold air exists for snow, although this is not always the case. Nonetheless, the storm produces heavy precipitation and chilly, northeast winds. A Nor'easter is a low pressure system, therefore it has a counterclockwise circulation. Just like any typical cold-core mid-latitude low pressure system it has a warm front and cold front. To the east of the low pressure center is where the warmer weather is found. Scattered showers and even thunderstorms occur there. It is to the west of the low pressure center where the more consistent precipitation is found. This is where the snow and ice commonly falls. For a model of the typical Nor'easter, look at figure 2. 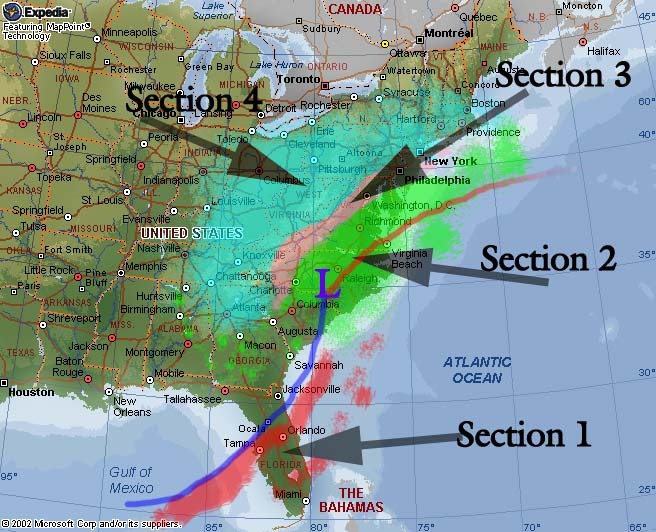 It is important to note that figure 2 is designed to show the typical structure of a Nor'easter, not necessarily the typical location of the storm. The first section of figure 1 shows thunderstorms along the trailing cold front. Here, it is possible that thunderstorms could even turn severe. In this location it is unseasonably warm and humid. Section 2 is around the location of the warm front. In this location is it mild and damp with consistent rain. However, soon, the warm front will pass to the north of this region and it the rain will likely come to an end. Section 3 is a mess. It is far enough away from the warm front to support frozen precipitation but not close enough to the cold air to support all snow. This region probably started off as snow and is now experiencing a mess of frozen precipitation. Depending on the track of the storm, this region could turn to all rain. And now we come to section 4, a perfect place to be if youre a snow lover. This region will get all snow with chilly northeast winds and possible blizzard conditions. Now it takes more than just a Nor'easter to bring the Northeast snow. Firstly, it is necessary to have a strong Polar high pressure center located in the southeastern portions of Canada. 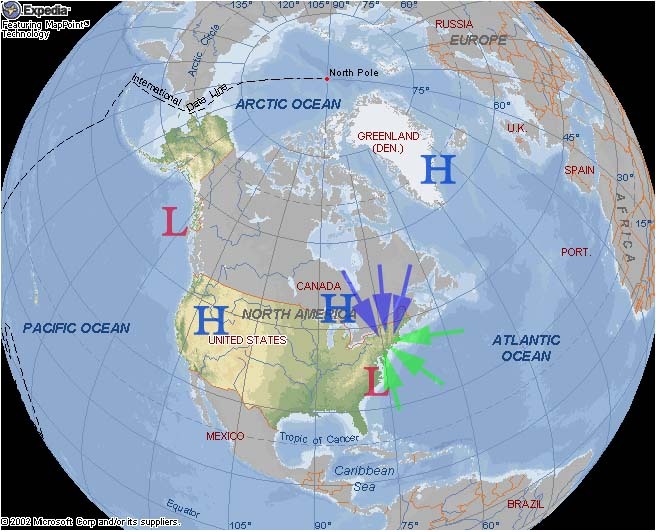 The high pressure center pulls colder air out of Canada and into New England as shown in Figure 3. When a Nor'easter forms and moves up the coast, it takes Atlantic moisture and rotates it back over the Northeast where it is cold enough to support snow. It is critical that the high pressure center maintains its position for most if not all of the storm. It is not an uncommon occurrence when a high pressure center funnels down cold air into the Northeast and then moves away. When this happens, our precipitation usually starts off as snow, but then changes to sleet and freezing rain, and then sometimes rain. This happens because the cold air source is lost, and the warm ocean air helps slowly erode away the cold air that was left behind. The second important factor in producing snow is the storm track. As we learned before the east side of the storm is the warm side, with the west side being colder and producing the persistent precipitation. Therefore if the storm tracks to the west of, oh lets say, Danbury, CT, then Danbury is not in a favorable setup for snow. Hence, the storm must take a track to the east of Danbury for us to get a good deal of snow. However, if the storm tracks to close to Danbury, warmer air will be pulled in off of the ocean and change the snow to a wintry mix or rain. In order for Danbury to stay close enough to the storm to get snow, but far enough way from the mild ocean influence, the storm must stay about 250 miles to the east. . 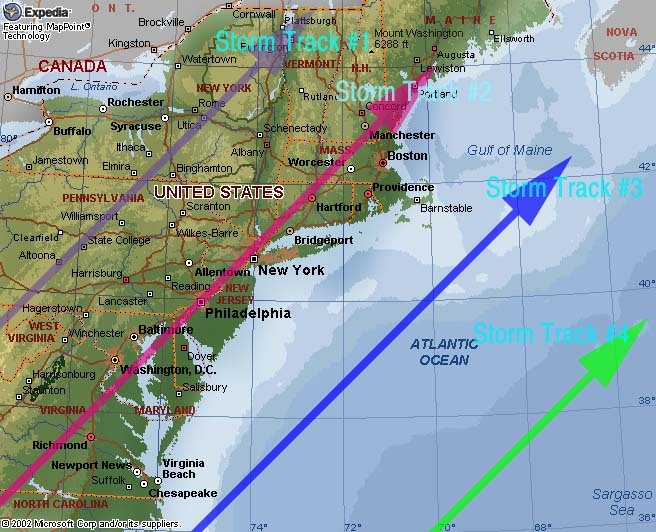 Figure 4 shows the most common storm tracks Nor'easters take. Storm track #1 is commonly called an "inside runner" because the center of the low pressure area is always inland. Because Danbury, CT is always on the east side of the low pressure area, this track would not bring us alot of snow. However, if a cold air mass was initially in place while this storm was moving up the coast, the result could be quite messy. Sometimes cold air damming occurs, which is cold air getting "stuck" in place east of the Appalachian Mountains, especially in the valleys away from the shore. Sometimes when this happens, western Pennsylvania s temperature can rise into the 70s, while temperatures remain below freezing in Connecticut. Eventually warmer air makes its way into the region, but not after a long bout with snow, sleet and especially freezing rain. Storm track #2 is called a "coast hugger" because its track parallels the coast (duh). Cold air damming does occur but is not as common in our region because the low pressure actually moves right over the region, and helps generate a strong ocean flow that better pushes the cold air further inland. If there were cold air initially in place, precipitation would start off as snow, but then change to freezing rain, and eventually rain. Very rarely does the temperature stay at or below 32 degrees in Danbury with the low tracking right overhead, but it did happen. One famous example was the Superstorm in 1993, which took a track directly through Danbury. Track 3 is what snow lovers crave. The low pressure area is close enough to provide plenty of moisture, but far enough away to keep the marine influence from changing the snow over to rain. Of course, it is necessary to have some sort of cold air in place while the Nor'easter is moving up the coast. Track 4 is the well known "out to sea" track. Usually whenever this occurs the storm is to far south and east to give us any precipitation, but skies can turn cloudy for a day. However, if the storm is big enough, or if there is another disturbance just to the north of the low pressure area, light snow could fall for a time in Connecticut. But generally, we get nothing more than clouds with this storm track. Nor'easters require plenty of moisture to form and stay strong. Normally these low pressure systems develop and rapidly intensify in the hot spots shown above. This is a model of the typical Nor'easter. The blue coloring is snow, pink is mixed precipiation, green is rain, and the red is thunderstorms. A strong high pressure well to our northwest is necessary for a significant snow event in our region. Typical storm tracks of Nor'easters. Each one spells out a different weather story. This website created and maintained by (soon to be Meteorologist) Michael Erickson, KB1IJV.